The incomplete courthouse at Parwan. In a report issued today (pdf), SIGAR provides details on how a project to build a courthouse at the Parwan complex languished with incompetent construction and poor oversight. 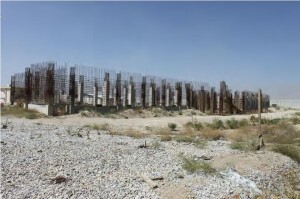 It was only after SIGAR provided a draft version of their report that the contracting authority changed the status of their stop-work order from one that would have allowed the contractor to receive the rest of the funds without completing the work to a status that prevented a huge financial reward for shoddy and incomplete work. The U.S. and Afghan governments signed a Letter of Agreement in 2006 that committed to improve governance by enhancing the administration of justice and rule of law. A key element in implementing this strategy was the development of a criminal justice facility known as the Justice Center in Parwan (JCIP). JCIP was designed to provide a secure facility for transferring Afghan combatants from U.S. military custody into the Afghan criminal justice system. The U.S. government was to assist with building, equipping, and operating the JCIP, as well as mentoring and training Afghan government personnel assigned to the facility. JCIP was planned as a complex of 11 buildings—a courthouse, offices, laboratory facilities, meeting hall, and housing—located adjacent to the existing Parwan Detention Facility, which is next to the Bagram Airfield north of Kabul. The courthouse was expected to be the centerpiece for Afghan national security trials. On June 13, 2011, DOD’s Bagram Regional Contracting Center (BRCC) 3 awarded a $2.38 million firm fixedprice contract (W91B4N-11-C-8066) to CLC Construction Company (CLC) to build a courthouse at the JCIP complex.4 The design documents called for construction of a 2-story courthouse, including 4 courtrooms, 6 judge’s chambers, 23 individual offices, and 4 holding cells. CLC was given 155 days to complete the project after the notice to proceed was issued on July 16, 2011. The contract also required CLC to perform engineering, review, verification, and concept design functions. On November 11, 2011, the contract was modified to increase the height of the courthouse ceilings and, as a result, the contract value was increased from $2.38 million to $2.67 million. 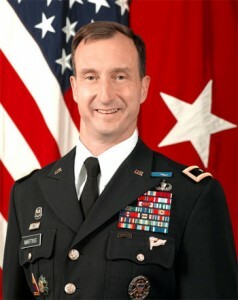 Brigadier General Mark Martins, CEO of Cover-ups R Us. The Obama administration’s handpicked choice to run prosecutions at the Guantánamo war crimes court is pledging a new era of transparency from the remote base, complete with near simultaneous transmissions of the proceedings to victims and reporters on U.S. soil. Army Brig. Gen. Mark Martins made the disclosure in a profile published Sunday in the Weekly Standard that likened the West Point, Oxford and Harvard Law graduate to a James Bond-style problem solver. It also cast Martins as “The Rebrander” of the at-times denounced military commissions system, which Barack Obama scorned as a candidate and senator then reformed with Congress as president. Despite the Weekly Standard’s fawning profile of Martins as some sort of savior to the system who will lend an air of legitimacy to the military commissions, Martins is in reality a hack who is dragged out periodically by the Pentagon to cover up its worst abuses. Martins was chosen by Obama to head the committee that attempted to re-brand indefinite detention as legal, has served as Commander and Deputy Commander of JTF 435, the notorious JSOC group charged with running detention programs in Afghanistan, has served as legal adviser to David Petraeus, and, in the most outrageously named position of all, now commands “the newly established Rule of Law Field Force-Afghanistan”. 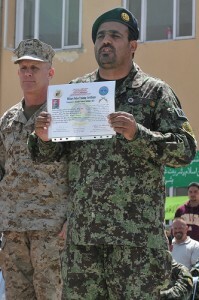 Brigadier General Martins assumed command of the newly established Rule of Law Field Force-Afghanistan on 1 September 2010. During the previous year, he served as the first Commander of Joint Task Force 435 and then as its first Deputy Commander upon Senate Confirmation of Vice Admiral Robert Harward. In these roles, Brigadier General Martins led the effort to reform United States detention operations in Afghanistan. Immediately prior to his deployment to Afghanistan, Brigadier General Martins co-led the interagency Detention Policy Task Force created by the President in January 2009. Martins’ career, then, consists of using his “West Point, Oxford and Harvard Law” degrees to cover up the blatantly illegal indefinite detention policy of the US, along with justifying torture and improper arrest of civilians in night raids in Afghanistan. I fail to see how the process described above is any kind of improvement in achieving release of prisoners who have been improperly detained. This description of the process also serves to expose as a sham the entire Special Task Force’s charge of improving how the US handles prisoners. And right in the middle of this mess is Obama’s hand-picked (through Gates) architect of the process, who now is dutifully overseeing its implementation. There is no getting around the fact that it would have been known that Martins would come up with a program designed to continue the efforts to cover up the imprisonment of innocent citizens. As I noted above, his previous assignments overlap with previous significant cover-ups. Also, as just one more example, Martins wrote an article (pdf) in 2004 that lovingly described the legal justification for the Commander’s Emergency Response Program (CERP) in Iraq. This program was in reality so loosely set up that it has been the subject of significant attention for misuse of funds. So while there is perhaps an improvement of conditions for reporters such as Rosenberg who will be covering the proceedings of the military commissions with the advent of near real-time broadcasts of the hearings, don’t expect any sudden changes in favor of the rule of law. Mark Martins has built his career around covering up the worst of Pentagon abuses and he now is in charge of covering up what can be considered its most prominent legal quagmire. Martins was chosen for this position precisely because the Pentagon knows it can count of him to promote the status quo while lending a false air of legitimacy.